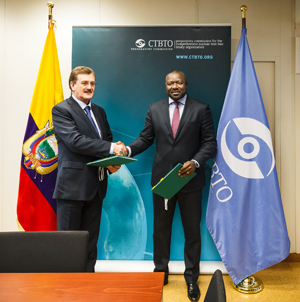 UNITED NATIONS, Mar 7 2016 (IPS) – The Comprehensive Test Ban Treaty Organisation (CTBTO), based in Vienna, will soon install two new monitoring stations in Ecuador. “I am very grateful to the Government and the people of Ecuador for this valuable contribution to global security, especially given the special status of the Galapagos Islands,” he added. The stations will be located on Galapagos Islands, a volcanic archipelago in the Pacific Ocean, and a province of Ecuador. Zerbo underlined the importance of both stations which are expected to enhance global coverage of the Comprehensive Test Ban Treaty (CTBT) verification regime. The stations will be located near the Equator, where detection capabilities through infrasound and radionuclide monitoring are relatively lower due to the absence of steadily flowing winds. The two stations will considerably enhance coverage for the Pacific Ocean, where hundreds of nuclear tests were conducted in past decades. According to CTBTO, the infrasound station in the Galapagos will not only enhance the verification regime’s global detection capabilities but also assist in regional disaster warning efforts, including detections of volcanic eruptions. There are a number of volcanoes in Ecuador, including the Tungurahua volcano which last erupted in April 2014. Data generated by both stations can also contribute to research of the atmosphere, storm systems and climate change. The CTBTO’s global monitoring network now comprises over 300 stations, some in the most remote and inaccessible areas of the earth and sea. The network captures four types of data: seismic (shockwaves in the earth), hydroacoustic (measuring sound through water), infrasound (low frequency sound) and radionuclide (radioactivity). It is about 90 percent complete. Currently, there are three certified seismic stations in Latin America (Argentina, Bolivia, Brazil), 16 auxiliary seismic stations, six certified infrasound stations, with two still planned, including the one in Ecuador, one hydroacoustic station (Juan Fernandez Island, Chile), and nine radionuclide stations, two of which are under construction – not including the one planned in Ecuador. There are also radionuclide laboratories in Argentina and Brazil. The locations of the various stations is prescribed by the CTBT and based on scientific methods which are designed to ensure complete coverage of the globe. Every additional station that is certified, improves the overall reliability of the network (which, incidentally, is already performing at a far higher and more accurate rate than was envisaged when the Treaty was being negotiated), according to CTBTO. The network is a way to guard against test ban treaty violations because the CTBT prohibits nuclear explosions worldwide: in the atmosphere, underwater and underground. “The CTBTO’s International Monitoring System has found a wider mission than its creators ever foresaw: monitoring an active and evolving Earth,” said Zerbo. He said some compare the system to a combined giant Earth stethoscope and sniffer that looks, listens, feels and sniffs for planetary irregularities. It’s the only global network which detects atmospheric radioactivity and sound waves which humans cannot hear, said Zerbo. He said the CTBTO would work closely together with all national stakeholders involved to ensure that the establishment of the two stations at the Galapagos Islands would be amongst the quickest ever undertaken by the organization, while ensuring the highest environmental protection standards during the stations’ installation and operation. He also expressed his appreciation for the Ecuadorian Foreign Ministry’s excellent coordination in this regard.